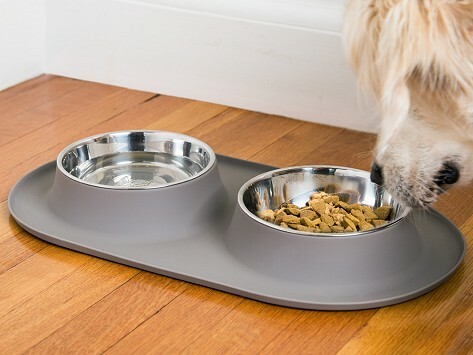 This sleek feeding station comes in eye-catching colors. The stainless steel bowls are removable for easy cleaning and the nonslip silicone base won’t damage your floor. A raised lip catches stray food to minimize your mutt’s mess and can even be used outdoors. Capacity: Medium: 11.8 oz. ; Large: 24 oz. ; Extra Large: 47.3 oz. Dimensions: Medium: 15.75" x 9" x 2.5"; Large: 20" x 11.37" x 2"; Extra Large: 24" x 13" x 2.5"
Weight: Medium: 0.97 lb. ; Large: 1.5 lbs. ; Extra Large: 2.4 lbs. It is just the right size and the bowls stay put! Nice and easy to keep clean.